Over the last 30 years technological improvements within the game of golf have been amazing. We now have golf balls that fly further and straighter with less spin. We have a better physiological understanding of how the golf swing works through 3D analysis. Ground pressure plates such as Swing Catalyst, TrackMan and other launch monitors all play their part in understanding what happens within the swing and the effects the swing has on the golf ball. Combine this with improved aerodynamics of golf balls and the sheer number of options you can choose from to improve is incredible. Matching your swing speed and spin rates gathered from a launch monitor data enables you to choose the most suitable ball. Over the same 30-year period, the average handicap within the game has hardly improved however. People still quit the game due to its complexity and difficulty, finding that the hours and hours spent on hitting thousands of balls is worthless. For years people have sought new technology that will make everything easy and cause the ball to fly high and straight, and for a brief period their golf game may look a little better, but it then plateaus, and performance falls again. To understand how to improve, you must understand how our brain works and more importantly how our brain retains information and how we can best transfer our skills from the range to the golf course. We need look at how we practice. Most people have heard of the terms Block Practice and Random Practice. These are both great ways to help improvement, though to gain the most from these you must be very specific in what you are trying to do. Achieving improvement that lasts over a longer time requires a high level of concentration and a task where your performance can be measured and learned from. Learning and being reflective on what you are trying to do is crucial in retaining the information. Your brain will better absorb the information if you consciously reflect on the process. This is a skill that all Tour players are good at as they are searching for information and reasoning behind why they hit a shot. If, like most people, you find yourself getting frustrated and negatively critical of what you are doing, this will decrease your level of performance. Instead of becoming overly frustrated, accept the situation and challenge yourself to react in a way that will allow you to improve your game. Challenge yourself to accept the shot you have played and gain knowledge from that shot. In short, be open-minded to mistakes, accept those mistakes and learn from them. 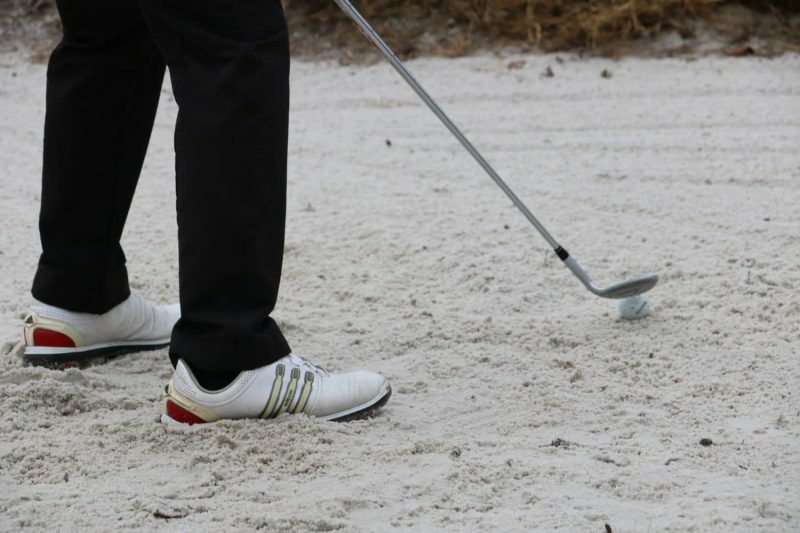 When struggling with distance control in putting, a drill that is both challenging and requires high levels of concentration is a ladder drill. Within this drill there must be a goal that is both challenging and achievable. Depending on your skill level, start with fewer balls and gradually increase the amount of balls. Start with 5 balls and begin at the 1st orange cone. The challenge is to get all 5 balls within the space between the single white cone and the line of 4 cones. Each ball must be shorter in distance than the previous ball. Once all the balls lie between the single white cone and line of 4 white cones, you can then increase the amount of balls to make it more challenging. For each putt you must change your location. If the ball goes longer than the previous ball, start all over again. 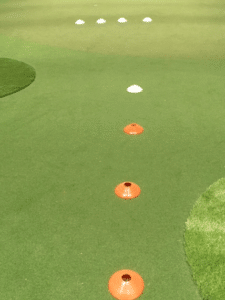 This is one of many ways that will help with your performance on the golf course. In the end, it takes patience and perseverance.